an architectural vanishing act, the disappearance of the vernacular home - GeekCast en Español..
ask any kid to draw a house, and chances are they’ll start with a rectangle and inevitably draw three lines on top — uncomplicated, but a realization that robert venturi would no doubt delight in. this notion of a house transcends culture and location, and manifests itself in two simple shapes, i.e. the vernacular home. this idea is was the starting point for architect kim seongyoul of rieuldorang atelier when designing the ‘manhwaricano’ home in korea. I started designing with the question of how architecture can enter the world of emotion,’ kim seongyoul describes. the architect wanted to discover beauty from ordinary things — like simple geometric shapes — and this is just what he and his team accomplished with this project. this design uses the shape of the ‘idea of a home’ to create a negative space in a complex and beautiful project; thus offering a poetic reading of the average inhabitance. all that remains of this old vernacular notion is the footprint it once occupied and the ideas it left behind. 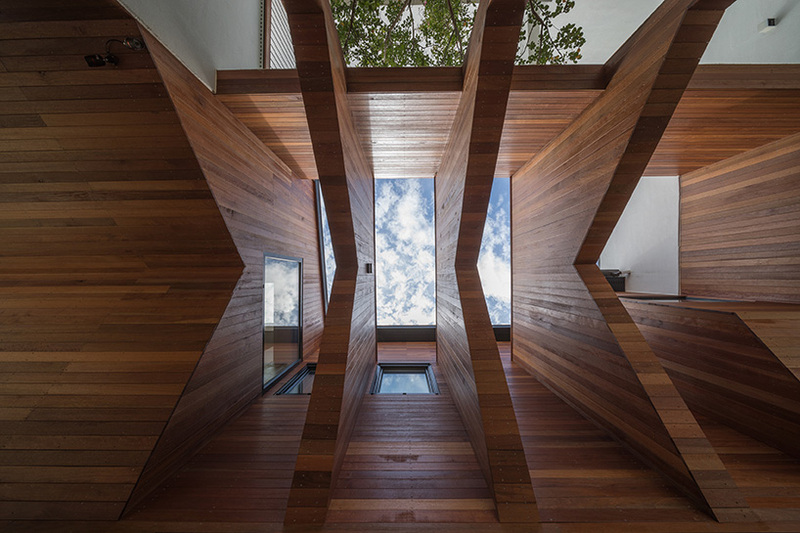 the vacated space in the form of a gable becomes a sequence leading into the house. kim seongyoul asserts that history is a part of any project and that architecture, like art, always fits in this eternal timeline.